Check prices BEFORE removing parts. Price list are available in the office. We accept cash and Visa/MasterCard/Discover for purchases. No checks. Identify the car make and model, and double check that the replacement part you have targeted will work for you. Many models have interchangeable parts. 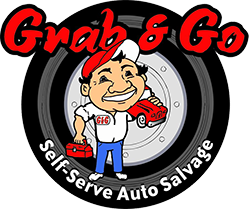 If in doubt, ask a Grab & Go Auto Salvage customer service representative to check for interchangeable parts.